Just as the right diet and medications are key to living well with Parkinson’s Disease (PD), maintaining emotional health is essential to physical health. A person diagnosed with Parkinson’s often feel a flood of emotions, as do their loved ones. Accepting and successfully navigating those feelings, whether anger, sadness, grief or even denial, is important. Stress can make PD symptoms worse. By focusing on your strengths, nurturing caring relationships, sharing your concerns, embracing healthy behaviors and your spirituality, you can better cope with the potential challenges of PD. PD symptoms and treatments can affect your mood. Depression and anxiety affect up to 50 percent of people living with PD. These mood changes can bring on worsening function, leading to a decreased quality of life. Tending to your emotional health keeps this cycle at bay. Be sure to meet with and speak with your doctor, who can recommend the right medical treatments. But also consider counseling, for you, and your loved ones if necessary, and a local or online PD support group. Counseling sessions — alone, as a couple, family or in a group — can provide support, understanding and education. A PD support group can offer a venue to share your experience with those on a similar journey. This can lift stress, foster new friendships and prevent isolation. Nature can be a inexpensive way to calm the soul. Take time this weekend and take a deep breath. Good afternoon friends today is Friday and for those of you suffering with loved ones battling the Parkinson’s disease we found that discovering the right medications, complementary therapies, support and ways to stay independent can enhance the quality of life for anyone with Parkinson’s disease (PD). Diet & Nutrition: The choices we make about food – what you eat, how much and when – impact your health and comfort. Cut down on all red meat and processed foods. Less impact on your immune system. Natural, organic and non GMO. Eating whole grains, vegetables, fruits, milk and dairy products, and protein-rich foods such as white meat and beans. Also consider including nuts, olive oil, fish, and eggs to your diet, for their beneficial fats. Emotional Well-Being: Emotional strength is vital to physical health. Learning ways to successfully navigate the many feelings associated with a Parkinson’s disease diagnosis. Life now is about laughter and patience. Each day is a struggle however with love and laughter smiles and bright cheer can improve the mindset of anyone with PD. Daily Living Activities: There are many ways to maintain a good quality of life when living with Parkinson’s. Physical activity and therapy like stretching, massage, and walking can help the blood flow and keep your organs functioning. Dental Health: Dental care can change with PD, but there are many strategies that can help avoid and treat dental issues. Parkinson’s can alter face and tongue muscle function, affecting speech and chewing. More visits to the dentist to avoid cavities and gum disease is recommended. Sexual Health: Men and women with PD often face challenges with sexual dysfunction, but there are various therapies and treatments that can help you and your loved one work through them. Advice for the Newly Diagnosed: If you've been recently diagnosed with PD, send a message and we would be happy to provide advice on how to cope with the early stages of PD. Living Alone: Prepare for caregivers and forging a path forward. To find one in your area, contact the Parkinson’s Foundation Helpline at 1-800-4PD-INFO (473-4636). Talking to Children: Children can understand what PD is with simple answers to basic questions. Use simple terms to explain your diagnosis, including the symptoms and what behaviors to expect. Support our mission to make life better for people with Parkinson's. Your gift will helps improve my care and advances research toward a cure. However, did you know that each patient has symptoms and signs that will be unique and individual. Some severe and some not too difficult to live with as long as you are getting proper nutrition and treatments. Good morning friends, family, and social followers! Today is Monday April 2nd, 2018 and I hope that you all have had a wonderful Easter Weekend. Today is the first business day of April and as April is a huge month for me and the Parkinson's Foundation we ask that you pay special attention to us this month. Support our mission to make life better for people with Parkinson's. Your gift will help us improve care and advance research toward a cure. This month we will be posting information so you can better learn about the disease, signs, treatment options, care, and ways you can get involved. 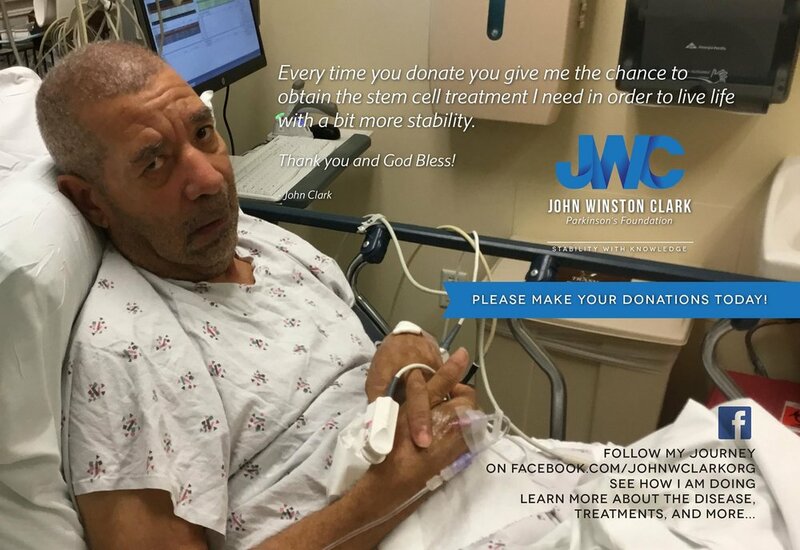 Please also visit my gofundme.com/help-john-clark page so that I am able to continue with stem cell treatments.